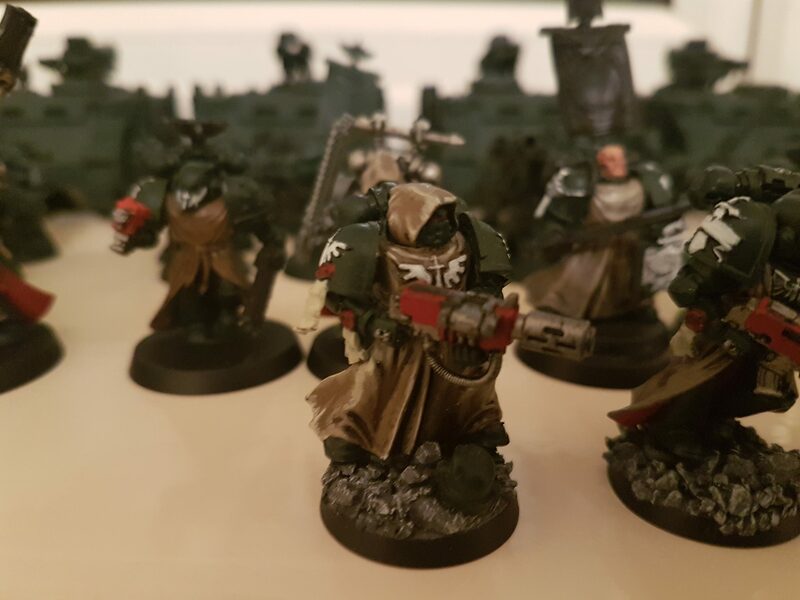 My friend Pete, current chair of the local games club (their blog HERE ) decided he wanted to run a homebrew roleplay game, using the Deathwatch of Gamesworkshop Warhammer 40k line of stuff. I have played his daft homebrew’s before, and they are entertaining but short-lived. For the setting, my preference is for the game to be a bit more serious. And this Deathwatch game fall into that category. Pete’s games often have high mortality, when they are 1 night only games. I am ok with that. This game is set to run over about 5 sessions, and after 2 ventures none of us have died yet (Survival rate higher than the last game…). The game is straightforward, and quite forgiving (so far) for new players (we’ve had new players and stand ins at the the table). I play Brother Chaplain Gabriel of the Dark Angels. For fun, I wrote an after action report from Gabriel’s point of view. Enjoy. In the name of the Emperor, we deployed to Bellerophon to assist the Inquisition in the recovery of Four Titan War Machines previously downed on the planet. Information supplied indicates no recovery by the Mechanicum has been attempted, nor is one scheduled. Shortly after landing on the planet, our location came under attack by a horde of feral orcs. With the assistance of the local garrison, my Battle Brothers and I were able to repel their incursion. The Xeno horde, as noted was feral with little in the way of weaponry, though they were led by a more developed Xeno, equipped in their regular fashion. All indications point to the Horde being driven by fear towards us. We showed them fear; all hail the Emperor, and Glory to the Lion! Once the Inquisitorial Base was secured Delta Squad took a Rhino Transport to the site of the first downed Titan, a Warhound. The Warhound was located in a large ravine beneath the crash site of an Ork Ramship (Abandoned according to what reconnaissance existed). Brother’s Wulf and Edwardius assumed overwatch positions, whilst Alonso entered the Warhound and I inspected the perimeter. The Titan was found in a field of wrecked tanks. Brother Alonso confirms my observation that the tanks are Imperial, but of non-standard patterns, for which someone WILL provide answers. Around the periphery I found corpses of guardsman in a state of desiccation. They were in a vanguard position to the Titan, facing away. Curiously, I also found the corpses of a Skittari force. Their bodies were much fresher than the Guard, and their position indicate they fell facing the Warhound. Conclusion. A salvage effort has already been attempted, unsuccessfully. It is also possible the Warhound fired on the Skittari. Some battle damage on the tanks supports this theory. Lady Inquisitor, the failure of the Servants of the Emperor to recover these Titans is requiring of answer. Failure to Inform yourself, or the Deathwatch of the previous salvage attempt is negligent at best, treasonous at worst. I submit myself as ready to exact answers from any individual responsible for these failures. My inspection revealed the likely cause of the Titan’s demise. The strut of a space vehicle had sheared into the Warhound’s left leg, causing it to fall. The Nearby land was scarred in a fashion consistent with the crash of a spacecraft, and a large vehicle/thing dragging it away to the Ork Ship. Brother Alonso reported that upon gaining entry to the Warhound, it was of Non-Standard, and indeed, an unfamiliar pattern. The interior workings were more consistent with an organism, than something mechanical. Brother Alonso reported that the power core was dead and that there was a crew compliment of three, all deceased. Brother Alonso noted also that the commander of the Titan was a Magos, rather than a Principes and that standard crew compliment of a Warhound is 5, and not 3. Whilst Brother Alonso and I made our investigations, Brothers Wulf and Edwardius maintained guard, reporting limited but suspicious movement on the cliffs above but with no details. A round was fired at the cliff to drive the assumed enemy from cover, to no avail. Given no enemy contact, a crawler was summoned to remove the Titan. Whilst inspecting the site of the aforementioned explosion, presumed to be the craft that broke apart and sheared into the leg of the Titan, I encountered a Xeno that had been upgraded with what appeared to be Mechanicus equipment. It was easily dispatched, and I relayed imagery to Brother Alonso who confirmed my suspicions that we were witness to a Tech Heresy in progress. A Horde of these Mechanicus-Enhanced Xenos attacked us from hidden tunnels within the cliffs, swarming towards the command centre of the Warhound. Their numbers were legion. Their skill was inadequate. They were cut down to the last, and a timely bombing run by our Maruader Air Support called in by Brother Wulf cut off their reinforcements. I choose to commend the Guardsmen deployed to defend the crawler, who performed their duties with competence. With the Xenos repelled, crawler operations to recover the Warhound were completed, and Delta Squad moved to investigate the Ork crash site (and camp). Brother Alonso inspected a tunnel, found atop the cliff at the Xeno camp, bored through the ground with dust coming out; he surmised evidence of digging. I inspected the hulk where whatever crashed ship had been dragged to. We discovered a human sized escape pod, with non-standard configuration similar to the interior of the Warhound, deep within the Ork craft. Brother Alonso reports that the Warhound Crew were directly linked/grafted in some heretical fashion to the Titan, and this pod showed similar design. Exterior damage confirms it was one of its landing struts that sheared the Warhound’s leg. We detected an Imperial signal from within the Ork Ship and investigated, finding a Magos performing heretical experiments on Xeno body parts. We killed him, and destroyed the vessel by rigging the reactor to explode to prevent any creation of his ever seeing light of day. Lady Inquisitor, evidence suggests you have been lied to. The Mechanicum appear to be deploying non-standard pattern equipment here for testing. They have lied to you about previous salvage efforts. And one of their Magos (at least) was involved in a Tech Heresy. In the name of the Emperor, and the Lion, I will find answers and the heretics will suffer. All hail the Emperor, and Glory to the Lion! I still find it hard to run prolonged campaigns, but glad you enjoyed this one!